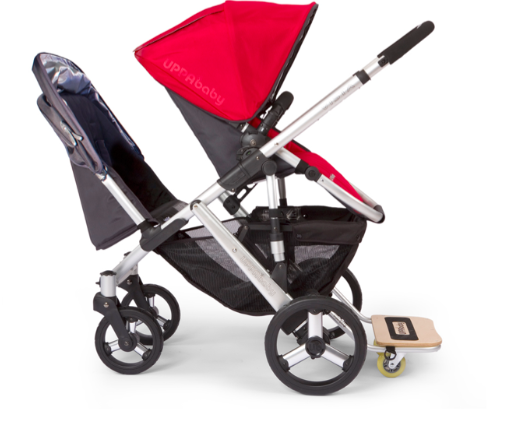 Lately my toddler has been revolting against sitting in her stroller by unclicking her straps and climbing out (Uppa Baby Pictured Below) which is understandable and fine for the most part since she should be able to explore and move around as toddlers do. But at times I need to have her strapped in to the stroller for her own safety and my sanity while I tend to her little sister or attempt Christmas shopping this holiday amongst the insane crowds. I’ve been so frustrated lately that every stroller I’ve looked at has had the same simple one button release mechanism which she can easily get out of. And I don’t like the idea of using things that would be hard to undo (knots, clips) that would not be simple to undo quickly in the case of an emergency. Well, the other day I had an awesome brainstorm. 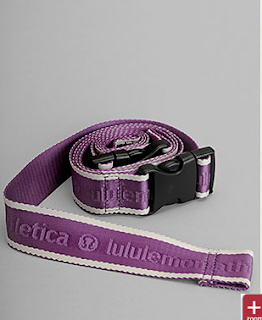 Yoga Mat Straps!!! I found the Click and Go Mat Straps the perfect solution. I can wrap it around the seat (hers is the bottom rumble seat) and she cannot unclick these ones and run off. This handy solution cost me $15 which is much easier then spending $$ on a whole new stroller which she would only be using for another few months anyways. And when were done with using this for it’s unintended purpose I can use it on my actual yoga matt. "More Pictures of Ruffled Groove Pants"
"The Vancouver Sun mention of Lululemon on Oprah (and Ethical Bean)"